In order to spread cancer, tumor cells must make their way through collagen, which is the most abundant protein in the human body and provides structural strength to bones and tissue. One enzyme, which scientists have dubbed MT1-MMP, can "sit" on the surface of a tumor cell and digest the collagen in its path, opening a tunnel for tumor cells to spread. The new results suggest that it may be possible to disrupt how this enzyme "sits" on a tumor cell, potentially blocking its ability to digest collagen and hindering the spread of cancer. "The MT1-MMP enzyme has four 'blades,' like the blades on a propeller. Our study shows that two of the blades stick to tumor cells," said Steven Van Doren, a professor of biochemistry in MU's College of Agriculture, Food and Natural Resources. "Because there are two blades, the enzyme can stick to the cell in two different ways. We found that one orientation allows the enzyme to digest the collagen while the other probably interferes with that process." 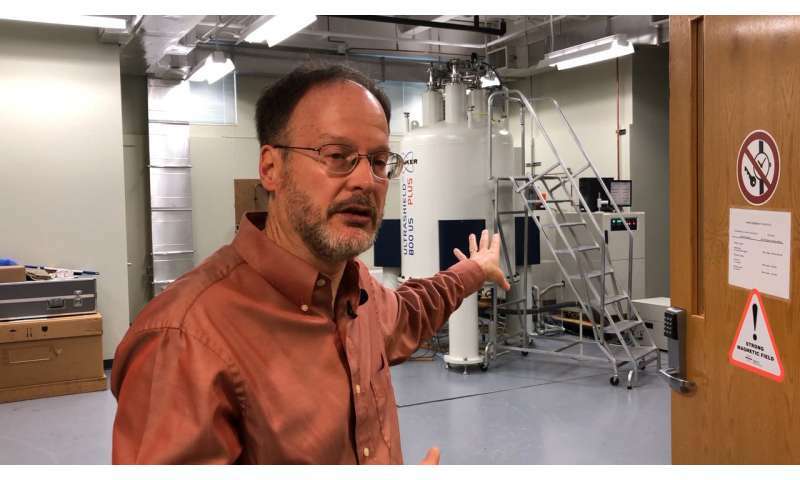 Van Doren and his colleagues used an 800 MHz nuclear magnetic resonance (NMR) spectrometer, the most powerful NMR spectrometer in the state of Missouri, to observe how the MT1-MMP enzyme bound itself to tumor cells. The spectrometer used radio waves to track the relevant molecules, allowing the researchers to identify the specific "blades" that are critical for binding to cells and digesting collagen. The conclusions were corroborated by other measurements using fluorescent light. By shedding light on the specific positioning of these blades and the corresponding interactions with collagen, researchers have opened the door to interfering in this enzyme's digestion of collagen, a strategy that could close an important avenue for the spread of cancer through the body. "We now understand the importance of targeting enzymes like this one selectively," Van Doren said. "This class of enzyme—metalloproteinases—had been studied decades ago, but the focus was too broad. As a result, the studies failed and these enzymes were neglected. Focusing specifically on the MT1-MMP enzyme allowed us to gather specific results that have practical applications for potential pharmaceuticals and further research." The study, "MT1-MMP binds membranes by opposite tips of its β propeller to position it for pericellular proteolysis," was published in Structure.